Today, we live in a world where sharing has become one of our primary focuses in life. Whether it’s photos from an African safari trip on Instagram, a video of a child’s first steps on Facebook, or a celebrity spotting on Twitter, there is no limit to what and how we post on social media. But what if you’re not interested in all the crazy social noise? What if you just want to share business news, job opportunities, and connect with people on a more professional level? Thanks to LinkedIn, we can drown out a lot of the extra social chatter and get down to business. What is LinkedIn For Business? 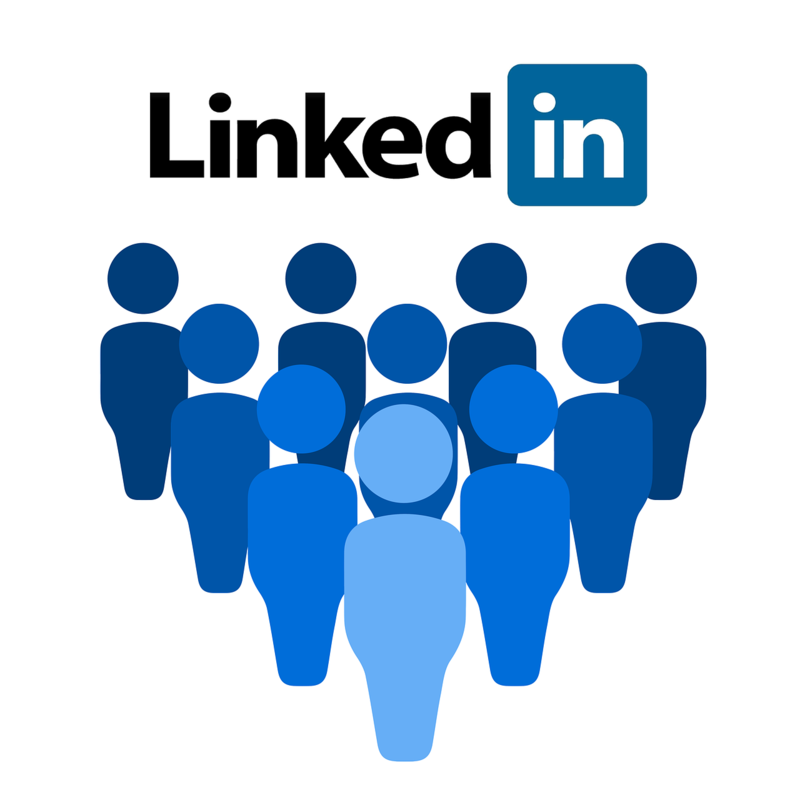 With 467 million users, LinkedIn is the largest social media site for professional networking. 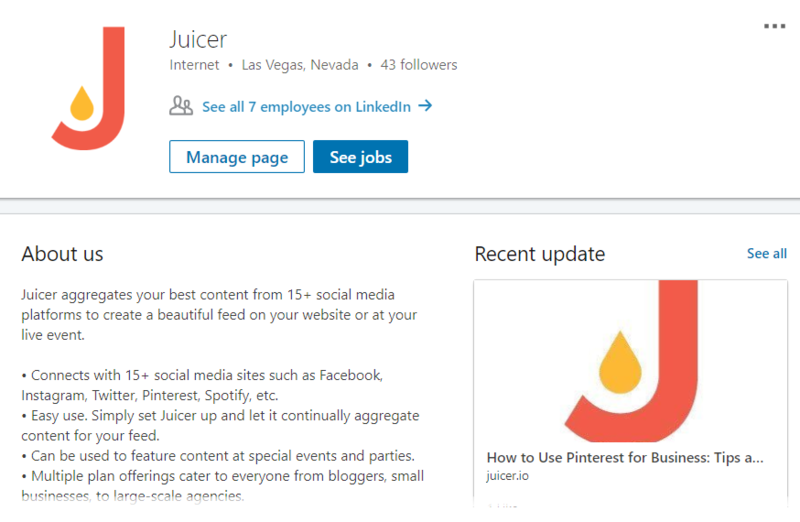 While other social media platforms are based on following and growing “friends”, LinkedIn helps you focus on building strategic connections and relationships based on professional interests. LinkedIn focuses on quality not quantity, even your profile stops counting after you’ve reached 500+ connections. How do I promote my business on LinkedIn? Your LinkedIn profile serves as a digital resume where you can connect to current and previous employers or clients by linking to their LinkedIn company page. You can connect with old colleagues, roommates, people within certain companies, or folks you may have met at a networking event. LinkedIn is all about growing and cultivating your professional network. Your LinkedIn profile is how you establish yourself and build a network. As a company, you can set up a LinkedIn business page that gives a description of the company, details, and list of employees. Through your company page you can post content and articles by sharing status updates. People can also choose to follow your company. Whether you’re a freelancer, recruiter, in sales, or looking for a career change, LinkedIn is a powerful marketing tool when used properly. As with all social media channels, there is a right way and wrong way to use LinkedIn for business. LinkedIn is a professional network, therefore social etiquette when using LinkedIn is far more important than on Facebook or Instagram. From setting up your business profile to sending InMail messages, you should know there are LinkedIn marketing do’s and don’ts. If you want to successfully use LinkedIn to improve connections and grow your network, you need to follow these rules of engagement. Before we can delve into the nitty gritty of engagement, we first need to ensure you have a strong business profile. After all, if your LinkedIn profile looks like it was completed on your 15 minute coffee break, who is going to want to connect with you? LinkedIn may be one of the only social media platforms where selfies aren’t popular. Your photo should be a high resolution headshot and as professional as possible. You don’t necessarily need to showcase a suit jacket, but a pleasant, smiling photo is best practice. LinkedIn is a search engine, and the best way to make yourself visible is to optimize your profile around keywords of interest. Everything in your profile should be optimized around your LinkedIn marketing strategy. In your headline, you have 120 characters that will explain exactly what you do. It is one of the most important elements in your profile as it is the most visible in searches. Most people just put their business title (i.e. Marketing Manager), but adding descriptive keywords such as Marketing Manager: content strategy, SEO, etc. will help you appear in search results and give people a better understanding of what your speciality is. Your summary is a more extended version of your headline, think of it as an elevator pitch where you can further explain what you do and pique someone’s interest. You want it to be direct but enticing. Make sure you also include your keywords here as well. Similar to a traditional resume, you can list all of your previous work experiences, dates, skills, and companies you have worked for. Linking to companies gives you more credibility and allows employers and potential clients to get a better idea of who you have done business with. Similar to the headline and summary, it is also important to include your keywords in your work experiences. Don’t be afraid to ask your peers, former colleagues, managers, or clients for endorsements and recommendations. This not only helps establish social proof, but helps with SEO and keyword optimization as well. It is a good idea to space out your requests and have each person speak to a different skill set. You can even guide them by providing an example recommendation with the keywords you want them to mention. If someone gives you a recommendation and endorsement, you should personally thank them and offer to give them a recommendation as well. You can even go one step further and send them a draft of what you are planning to say. Again, building and maintaining relationships is key. One of the biggest mistakes people make is not personalizing their LinkedIn marketing messages and requests. 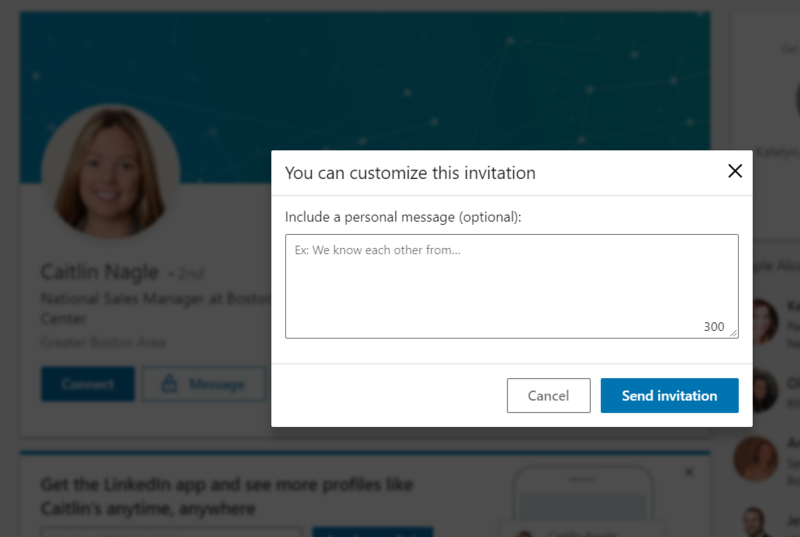 When inviting someone to connect, it is tempting to just click the Send Now button, which will trigger the default notification, however, if you take the time to do a little research and make a personal connection, those extra 5 minutes will be the difference between “accept” and “ignore”. This is extremely important, especially when connecting to people you don’t know. Boring! This gives me no information. Who are you? Why do you want to connect? It was great meeting you at the Marketing Conference in Boston yesterday. I really enjoyed hearing about how you’re evolving your latest sales techniques – I’d like to chat even more as you perfect the process. Before connecting, take a look at their profile to try and find a common interest, or reason for your message. For example, the person in question works for a company you are interested in, or you share a former colleague, don’t be afraid to use that in the message. You’ve sent your message request and hooray, they’ve accepted! Now what do you do? So many people drop the ball at this stage. They make the connection and forget it. You should follow up and thank them for accepting your request and start a conversation. Remember, the whole point of connecting is to build a relationship. You can complement them on their profile or share a business tip, but you shouldn’t ask them for anything just yet. Have a conversation first to build trust before you ask someone for something. Have you ever received a LinkedIn message from someone offering you a job you don’t even qualify for? Or an invitation to a networking event 5,000 miles away? It’s obvious this person didn’t even look at your profile. They are probably using an automated tool to send out mass messages to all of their connections. This is a quick way to ruin your potential for connecting and building relationships. No one likes spam. Everything you send to your contacts should be relevant and helpful to them specifically. If you receive a message back from someone, respond in a timely manner. No one likes to send a message only to have it read weeks later. You should check your LinkedIn messages daily and actively respond to keep conversations going. A great way to improve your connections and boost engagement is by sharing quality content on LinkedIn and actively sharing and commenting on others’ posts as well. Don’t just hit the little “thumbs up” button, communicate and engage. The content you share should always have your target audience in mind, your LinkedIn network. If you are strategic about your connections, then you should know what they will be interested in. By regularly posting valuable content, you stay top of mind. According to an article on Social Media Examiner, text posts are more popular on LinkedIn than image posts. This recommendation is quite the opposite from the idea that social media is all about images. Apparently LinkedIn isn’t a huge fan of links since it forces people off of the site. If you enjoy sharing links or blog articles, you should probably switch it up now and then. LinkedIn post limit is 1,300 characters. Social Media Examiner recommends writing short, yet compelling posts asking a question or taking a stand about something, but always invite comments. Engaging with your audience is key. If someone comments on your post, comment back. Feel free to share links and photos within the comments as well to expand upon your posts and give readers more information. There is so much content being shared on LinkedIn, but not all of it is worth engaging with. You need to find the most relevant content to you, and to those you hope to network with. Type keywords in the search bar and find content that is most relevant. You can then use that content to engage potential prospects and start quality conversations based on similar interests. LinkedIn recommends that you should post at least once a weekday, and the best time to post is early mornings, or after business hours. Each industry is different, we recommend doing your own research about your followers and when you find they are most active. Adapt your posting schedule to them. You went on a date Friday night and had a wonderful time. On work Monday morning, you come across your date’s profile on LinkedIn and decide that inviting him/her to join your network is a good idea. A week passes and it becomes apparent your request was ignored. If you’re looking to make friends or boost your love life, there are other social media platforms better suited for that. LinkedIn is about building professional relationships. Accepting a LinkedIn connection from everyone who sends you a request isn’t necessarily a good idea. A “LinkedIn Open Networker”, also known as a LION, means you are open to receiving every connection request you receive in order to expand your network, even from people you don’t know. In order to build the most valuable network, avoiding this type of open networking is recommended. As mentioned earlier, if you want to connect with someone you don’t know, the best way is to introduce yourself in a personalized message. This shows that you are not a spammer, and have a legitimate reason for wanting to connect. In the past if you went to a networking event, you were handed a business card. Over the next day or two, you would either call or email that person hoping to start building a relationship while you were still fresh in their minds. LinkedIn connections should be treated the same way. If you go to a networking event, or business conference and get people’s contact information, connect! Don’t let too much time pass before you’re forgotten. Again, remember to personalize the message. If you’re trying to come up with a creative way to restart conversations with some of your connections, LinkedIn’s notifications are fantastic ice breakers. Everytime someone hits a work anniversary, has a birthday, or changes a job, you get a notification and prompted scripts like “say congrats” or “say happy birthday”. As tempting as those one click messages are, don’t do it! This is a perfect opportunity for you to congratulate your connection personally and start a conversation. Similarly, if people reach out to you for your birthday or work anniversary, thank them and engage. LinkedIn Groups should definitely be part of your LinkedIn strategy. LinkedIn groups are a fantastic way to find potential clients and expand your network. Similarly to Facebook groups, LinkedIn groups are created around a specific topic such as “ startups”. You type in the keyword and LinkedIn will populate all of the groups associated with that word and show the number of members that belong to each one. Being active in a group, sharing posts, and engaging in comments will help you get noticed and make connections. Through LinkedIn, networking and building relationships is all done digitally, but we must never forget that even though you’re comfortably hidden behind your computer screen, professionalism and etiquette is still expected and admired. On all social media platforms there are rude people and trolls just waiting to bait you into the next online showdown. Everytime you engage, a digital footprint of your level of professionalism is left behind, so be sure to avoid any overly negative, inappropriate, or aggressive interactions. Once you’ve built a valuable and engaging LinkedIn presence, you can use that to leverage new and existing relationships. One great way to feature your LinkedIn activity is to embed a social media aggregator on your website. Your posts, activity, and engagements will be updated and featured daily. This allows your website visitors to get a further glimpse into your business network, hopefully incentivizing them to do business with you or at least connect. LinkedIn is truly a fantastic way to grow your business, or your personal brand. By following the LinkedIn Marketing Rules of Engagement, you will be well on your way to building connections, expanding your network and marketing your business the smart, professional way.